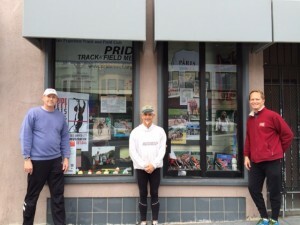 Jon Cain, Marcus Valera & Rick Thoman spent early Sunday morning prior to practice to set-up a team display in the Walgreen‘s window in Castro. Thanks, boys! 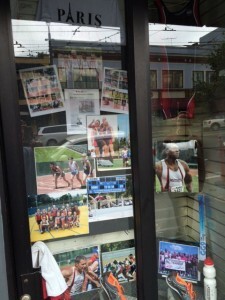 This year’s window displays our devastatingly gorgeous and glorious photos from past competitions, as well as medals from past Gay Games and some other props. But the highlight is the upcoming Pride Meet that everyone is going (right?). As you know, our annual Pride Meet is coming up on June 20. This year, we will be at San Francisco State University’s Cox Stadium. Online registration is open at Pride Meet website. 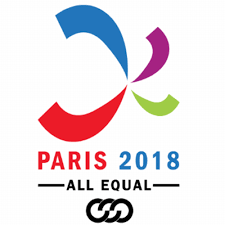 We are also looking for volunteers who will be working with meet officials and helping competitors on June 20. 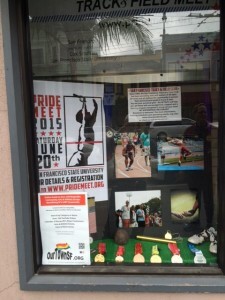 In case you are not familiar with Pride Meet, it is our annual track and field meet that is a USA Track and Field (USATF) sanctioned event. This year, it is also a USATF Pacific Association’s Grand Prix series event. While we take this meet seriously, we provide safe and rewarding athletic experience to all genders, races and abilities. And we also don’t forget to have some fun doing it. The display will be up until June 13. So, come and check it. You may be on display! By the way, many thanks to Walgreen’s who has let local nonprofit groups use this space for various promotions since 2009. Also, thanks go to ourtown.org for coordinating the display schedules.